Inotia 4 has been released this year! Initially it was only available in iOS, and I don’t own any iOS (nor do I want to own one) device so I looked for some wild APK of Inotia that would work on my Android. The guide started when my parent allowed me to borrow her Android device time to time because the game won’t function properly on my low-end Android phone. This version, which I think is incomplete, is the one I found outside Google Play. Inotia 4 was not yet out on Google Play (Android Market) officially so I needed this. I played it like some preview of the game. Some texts were left in Korean language. 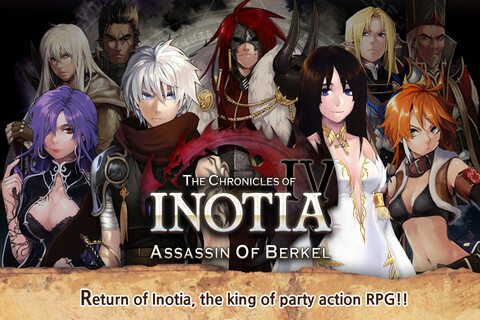 To download, go to Inotia 4 PLUS: Assassin of Berkel v1.0.3 – Android (by Com2uS Inc.), that page has several download links to the Inotia 4 APK. Update (July 12, 2012) – Finally, I began writing my Inotia 4 walkthrough! Scroll down to find it. Update (June 26, 2012) – The game runs well on my parent’s Samsung Galaxy S. Its screen is large enough, even though I think everything looks a bit stretched horizontally. And I could take screenshots of the game! I might not be able to write an Inotia 4 walkthrough though, because I am playing the game in bits. I’m only borrowing it when my parent is asleep. Update (June 24, 2012) – I’ve been waiting for Inotia 4 to become available in Google Play (Android Market), but still can’t see it there when I search. I found an APK of the game somewhere in the web though. It’s called Inotia 4 PLUS. I don’t know why there’s PLUS on the name. It installed successfully and I was able to play, BUT character artworks and texts have fuzzy edges. I could hardly read the texts. I realized that my Android phone’s screen is too small for the game when my boyfriend installed it on his phone – it was crystal clear in his phone! So, it seems I’m going to delay writing a walkthrough for Inotia 4. That will be until… either when I get a better Android device (probably not anytime soon) or when there’s an updated release of the game that would look better on Android devices with smaller screens. I’m finally starting my walkthrough for Inotia 4. 🙂 The copy I have is buggy but I’m playing it anyway. 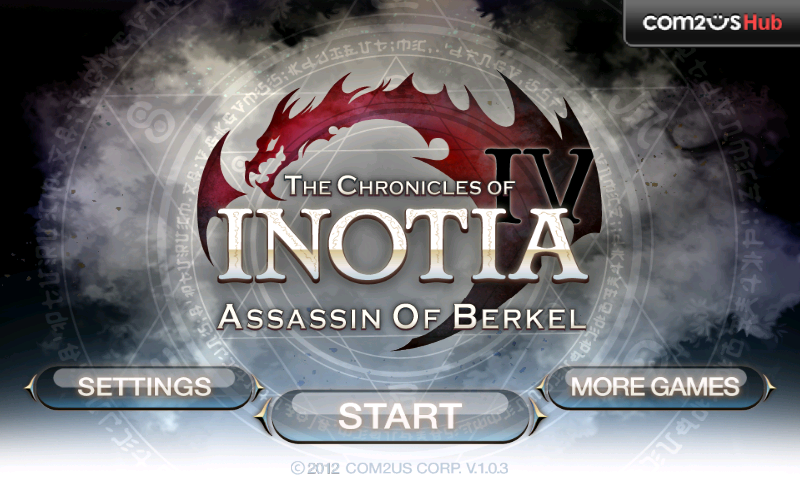 It’s Inotia 4 Plus version 1.0.3, and I play it on my parent’s Samsung Galaxy S (Android 2.3, Gingerbread). My plan for this Inotia 4 walkthrough is to cover only the guide for quests, just to help people reach the end of Inotia 4’s story while doing the optional quests to gain gold, experience points, and extra items. You can turn the Sound on or off here. “Light Effect” can also be turned on or off here, but I’m not sure what light effect is in this game. Maybe it has something to do with spells you cast? There’s option for Data Backup. You can either save or load your data from this settings screen. I never tried this feature, but it says “You need to register or login to Com2uS Hub if you want to use the data backup/restore”. I think it’s useful in cases like when you’re resetting your device to factory settings. 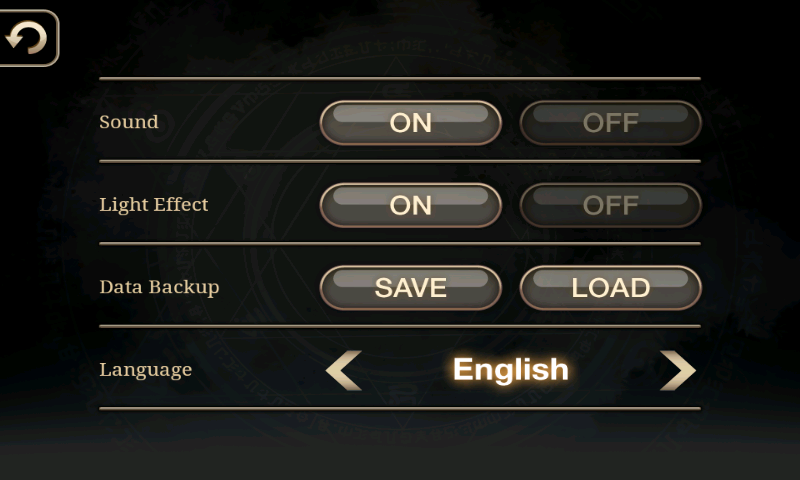 The last item in the settings screen is Language. English, Chinese, Japanese, and Korean are available. It frightened me when I accidentally set my language to Chinese. I couldn’t understand a thing! Hahaha. Good thing it isn’t hard to change back into English. Now we see the screen where we can select save slots. I placed labels on the screen’s buttons. I’m not trying to be a female Captain Obvious here. :p Just helping out so no one fails to notice any button. Oh, I just hope *I* don’t miss placing label on any button! (>_<) So... pressing an occupied slot will let you load that, and pressing an empty slot will let you begin a new game. Hit the Back button on the top left if you want to go back to the main menu. I already have a saved game there on the first slot, but I'm gonna choose an empty slot so I can play the same pace with you. We have 6 different character classes to choose from. I’m going to choose the Assassin. The original power of noble knights were beyond what humans can hold. 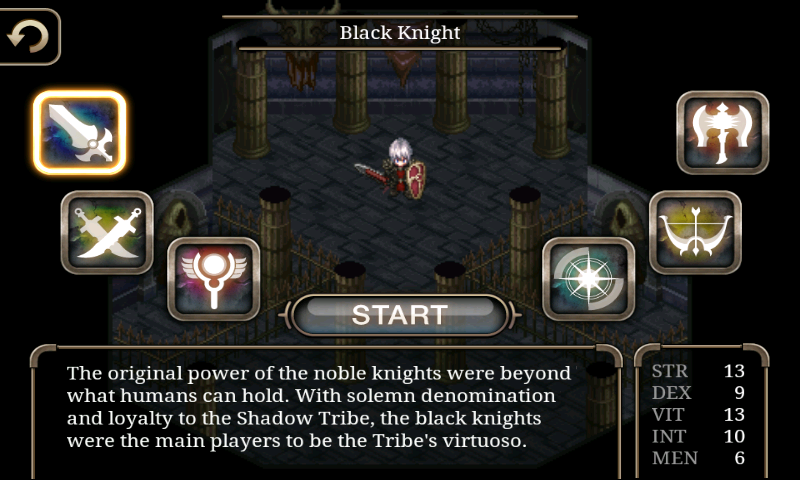 With solemn denomination and loyalty to the Shadow Tribe, the black knights were the main players to be the Tribe’s virtuoso. They have been a part of the Inotian continent for a long time. With many rigorous training coursesand real battle skills, they hold the strongest independent combat powers on the continent. These wizards have been lured to the fascinating dark powers of the Shadow Tribe than of religious faith towards the church. Their practice of magic and witchcraftry is of the highest destruction on the Inotian continent. Some of the dark Shadow Followers were once devoting priests of the Life-giver, Tamit. Their distorted faith towards dark magic is more destructive than it was when they were empowered with powers of the light. In the woods, away from most human activities, live these pursuers. Shadow Tribe members contact them to collect valuable information that provides their survival. From the highlands, north of the Inotian continent are a champion of savages. Some of them are mercenaries of the Shadow Tribe, not for honor or wealth, but for their strong desire to slaughter enemies in battles. Press the icon of the character class that you choose, then press START button again. After the scene, you gain control in the game. You’ll see many buttons on the screen. 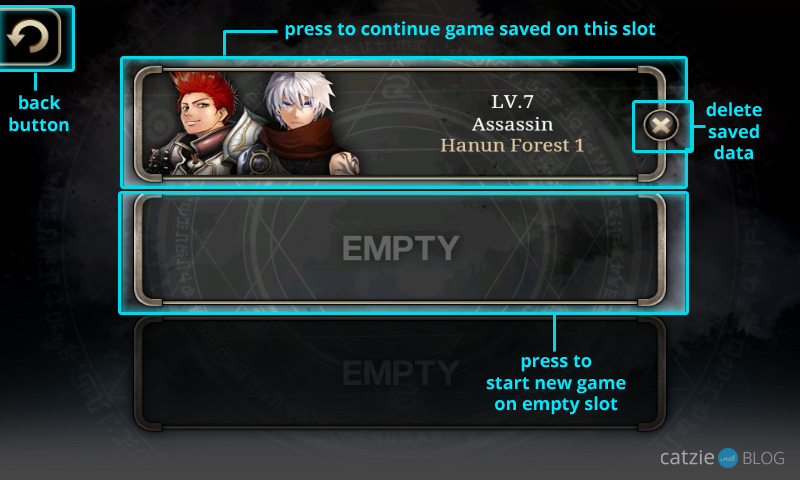 Following is a screenshot with button labels to help you understand this game’s interface. Let me describe the purpose of the buttons. Mini Map See where your character (silver mark) is on the map. The green marks indicate passages/exits. The white round marks indicate shop keepers or NPC’s that you can talk to. Save Game Save your current progress to the corresponding slot. Online Shop I never actually tried this. Maybe you can buy some special items from there. Game Menu When you press this you’ll be taken to the screen where you can find the screens for Character Statuses, Items, Skills, Party Management, Quests, and Options. More info on these screens later. Directional Pad Moves your character. 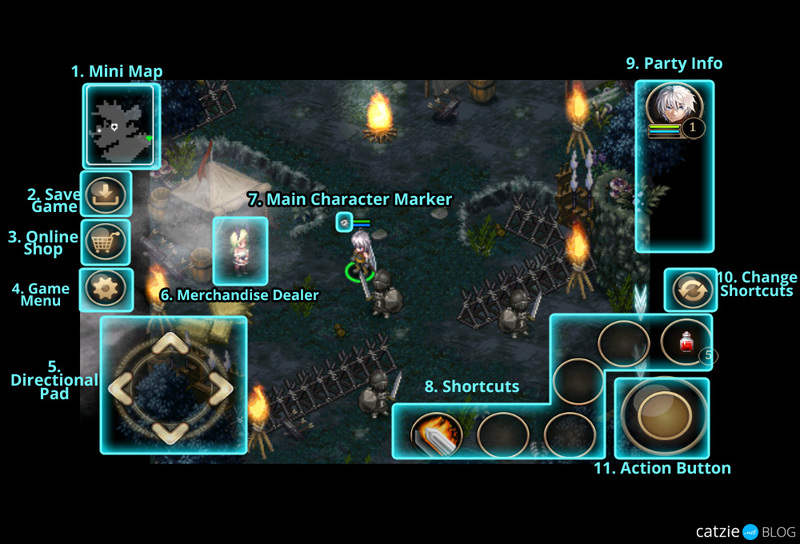 Main Character Marker That grayish icon indicates where Kiyan, the main character, is. Shortcuts You have here 6 slots where you can register skills and potions that you often use. I feel that I always need more slots. Party Info This area shows characters that are in your party. Change Shortcuts This button lets you modify shortcuts. Status Tab – This tab is the active tab in the screenshot above. It will show you information about your active party members. Bag Tab – Your items are shown here. You can equip multiple bags so you could hold more items. Initially you have only one bag and it has 16 slots. You can get more bags to equip from merchants or monster drops. Take note that there’s a special bag in the Bag screen. It’s the QUEST bag at the bottom right, with a letter “Q” on it. It stores items that are related to your quests. Pressing on consumable items like potions give you the option to USE, set HOTKEY ON (shortcut), or DESTROY. Skill Tab – Make your character learn new skills every time you level up and gain more skill points. Party Tab – Here you can find mercenaries that you get. This is where you can add and remove characters to/from your party. You can also delete mercenaries here. Quest Tab – This helps you keep track of what you should do to make progress with the story. There should be labels whether each quest is a main quest or an optional quest. System Tab – This lets you save the game (though you can save the game from the main game screen), get HELP, or go back to MAIN MENU. Party Members – This area shows the portraits of your party members. My screenshot shows only 1 member, but later on in the game you can have up to two more members. Just press on the picture of the party member whose status you’d like to check or set. Basic Character Info – Shows character level, character class, and name. Available status points, available skill points, HP, MP, and Experience Points are also shown. Status Points – Pressing on the button with (+) plus sign lets you add points to your STR, DEX, VIT, INT, and MEN. Allocate your points wisely. 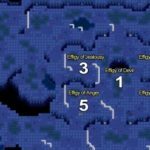 More Info – This area shows the calculated total amount of damage, magic damage, and etc. that your character can do. These are based on your status (STR, DEX, VIT, INT, and MEN) and equipment. Now let’s move along. Go East like your companion told you to find Darius. Watch the scene. Darius, the vice-leader of the Shadow Tribe, ordered Kiyan to assassinate Earl Grafton. Follow the Earl’s crew, do away with him, and report back to Darius. There will be non-aggressive monsters in this map, meaning they won’t attack you until you start attacking them. Let’s attack them now (I feel that I sound so mean!) so we start gathering gold, items, and experience points soon. Head South, approach the bat, and press the action button to attack. You need to press it only once and your character will automatically attack it until it’s dead. You will notice that a skill and a small Healing Potion are already set on the shortcuts area for you. Enemies will drop gold and items when killed. Walk over those objects to pick up. Enemies drop mana gems (shiny blue orbs) as you attack them. Picking them up lets you recover MP faster. Tip: Picking up mana gems while fighting tough enemies, especially bosses, keeps you from running out of mana so you can continuously use your skills in battle. Another tip, for later when you get party members: Using healing potions heals all party members at once. Move your character to the East side of the map to trigger another scene. Save your game and prepare to fight 3 Berkel Soldiers. When you defeat them and go South a little, you’ll notice Clear Springs. Press the action while facing springs like this to recover HP and/or MP. Exit this area on the South-Eastern side of the map. Watch another scene. Then, follow the path until you reach a barricade that has a question mark (?) floating above it. Examine using the action button. Watch the scene. Prepare for another fight with Berkel Soldiers. When they are defeated, head South then East to the Cave of Silence entrance. Note that from that point onwards, enemies will be aggressive. Follow the path, getting rid of the enemies as you come across them, until you reach the exit at Northeast. Save before you go, because the next map won’t let you save. Tip: When entering a passage and the game notified you that you won’t be able to save in that map, it usually means there’s a coming battle in the next map. So, prepare for that. Now we encounter Earl Grafton. Watch the scene and defeat him in the fight. Tip: Kill underlings before killing bosses during fights may make things easier for you. Tip: Each time you level up, check for status points and skill points and use them up to strengthen your character. Watch the scene that follows the defeat of Earl Grafton. Make your way back to Darius. He’s in the Shadow Tribe Camp, where you first gained control of your character in the game. Tip: People, passages, or objects with blinking question marks above them are the ones you talk to, enter, or examine to make progress with quests. Cardinal Janus has an assignment for Kiyan. Find Janus in Sanctus Imriel, the Empire’s church. Go to the northern exit of the Shadow Hall. The Sanctus Imrielis at the northeast side of Berkel Capital. First, exit the room. Climb the stairs and take the Northern exit, the one where light shines through. You will be in Berkel Capital. Go to the Northeast of the map to find the church. It will have a question mark floating near the passage. Enter it and you’ll find Janus. Watch the scene. Janus ordered Kiyan to disguise as a Berkel Knight to take part in the Channel Rescue Operation. Go to Portia to learn how to be part of the Rescue Team. She will be at the Shadow Hall. For your knight uniform, you need to get reagents and 5 ectoplasms from the Shadow Training Dungeon 2. Return back to Portia after you get these necessities. Dark Sorcerer Kane requests you to terminate 5 knife-needled mosquitoes that live in Shadow Training Dungeon 2. The Fusion Machine requests you to collect 5 pieces of metal from the Shadow Warehouse. Enter the passage to the right of the fusion machine, next to where a boy stands. See the screenshot below for some visual help. I encircled the object that you need to collect in the warehouse. Walk over it to pick up. You need to collect only 5. 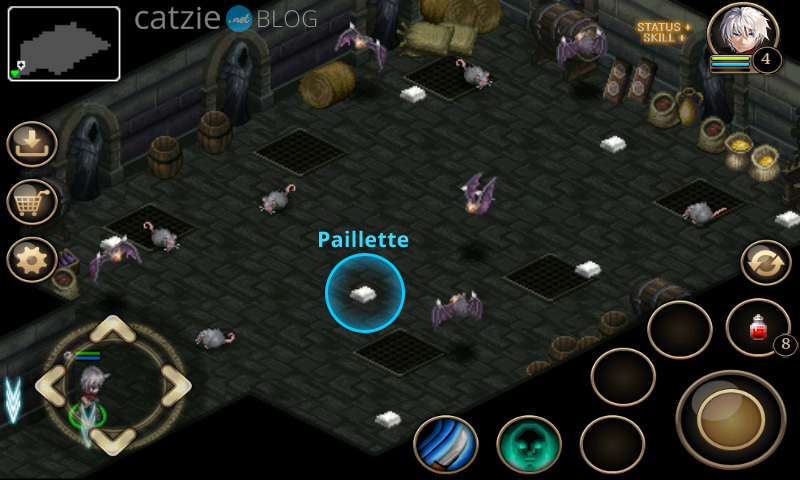 Kill Wine-Drunken Bats and Rats as you go so that you gain experience points and gold. Note that each time you pick up a quest item, you will see on the top center part of your screen how many more you need to fulfill the quest. For example, when you pick your first Paillette, you will see “1/5 Paillette”. Pick 4 more Paillette to fulfill the required number of objects. If the message no longer appears when you pick up the quest item, it means you already collected enough. When the business in the warehouse is done, exit, and examine the fusion machine again. You can repeat the quest if you want to. Now, let us go to the Shadow Training Dungeon 2 to do the other quests. Head down the stairs, and enter the passage on the Southwest of the map. You will be at Shadow Training Dungeon 1, where monsters are not aggressive. To get to the Dungeon number 2, take the Southwest exit. Remember what we need to do: Kill 5 Knife-Needled Mosquitoes and collect 5 ectoplasms from Reagents. There are only mosquitoes and Reagents in this dungeon. The ectoplasms are not always dropped by Reagents you kill, so you’ll probably need to kill over 5 Reagents until you get 5 dropped ectoplasms. Tip: Monsters respawn after some time. If you don’t want to wait until they respawn, exit then re-enter the map to make them instantly respawned. Reminder: You can check how much you progressed in your quests by opening the Game Menu and going to the Quests tab. When you get everything you need, return to the Shadow Hall by exiting to the East then Northeast. Reminder: Blinking question marks usually indicate the person or object that you need to talk to or examine to fulfill quests. Talk to Dark Sorcerer Kane. Now let’s talk to Portia. 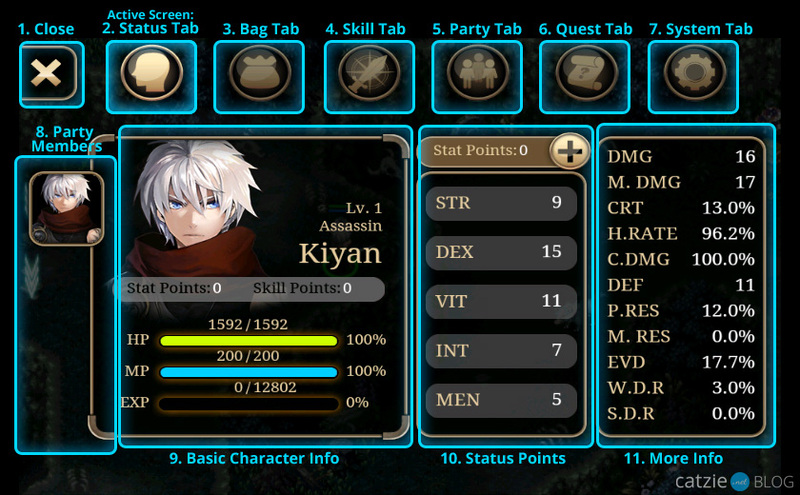 Kiyan, as an assassin, gets Berkel Leather Armor. Darius hands Kiyan the Mercenary Emblem, a sign that enables him to recruit mercenaries when needed. Learn how to use the emblem and get mercenaries, and then return to Darius. Required: Use the mercenary emblem. To fulfill this quest, open your Game Menu and then choose the Bag tab. See the following screenshot for some visual help. The item you need to select in the bag is marked. 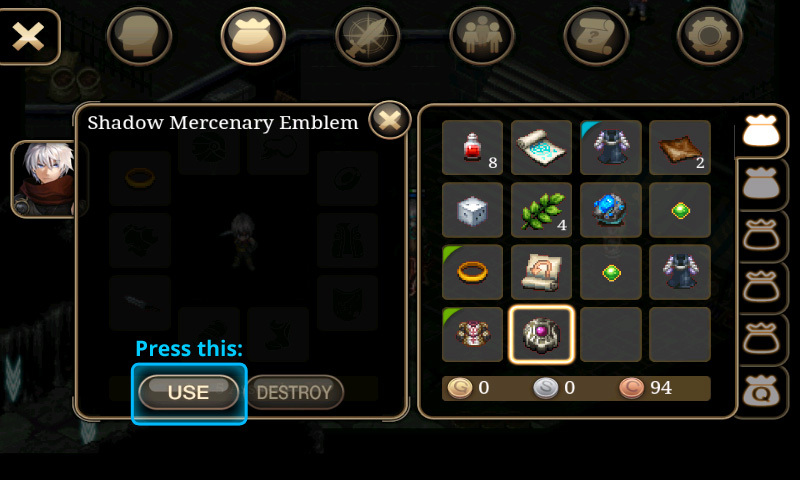 The USE button on the left side will appear when you press the Shadow Mercenary Emblem item. After pressing USE, you should check the new mercenary you got by going to the Party Tab in the Game Menu. He or she is now an active party member. What class did you get? I got a Priest, and I was like “Wow, lucky” at first because I think a healer is essential in the party, but then I saw that this Priest doesn’t have a healing spell. :-[ I don’t like the mercenaries in Inotia 4, to be honest. I feel that they are very weak, unlike in Inotia 3. When done checking your mercenary, talk to Darius again. He’ll offer to fill you in with some info about mercenaries. I’m going to place the info here, with a few modifications to make terms consistent, for reference. The Party Tab will let you know exactly what is happening with your hired crew. You can Recruit and/or Release them at this tab. You will be able to see their stats, skills, and equipment. You are the party leader, so you’ll be the one to attack any target. The two other party members will follow you. Tap twice on “Character Info” and your men will attack the target. Also, tap once more on Character Info to control your men however you please. * On the Party Info area, tap on the photo of a member to set him/her as leader of the party. If you go to Skills Tab and press “A.I.”, you can set your party members as your AI followers. Not only can you decide on the times each mercenary uses skills, but you can also go to the SETTINGS key below and select how many auto-counterattacks you’re going to hit. Battle style will differ according to how AI settings are arranged, so use the best one that fits you. To be a rescue team member, you need to take Janus’ recommendation letter to Lehman who is at Hanun Forest 1. Hanun Forest 1 is at the southeast of Berkel Capital. Tip: Visit the Merchandise Store to stock up some healing potions and resurrection scroll to keep your party members alive. It is located to the left of the church. Let’s exit Berkel Capital through the South East passage near the weapon shop. We are now at Hanun Forest 1. You’ll see a dark guy Bounty Hunter Lars standing past the gate. Talk to him to get your first Bounty Hunter quest. Defeat the acid slime and starving wolf boss and return to Bounty Hunter Lars. Required: 1 Acid Slime and 1 Starving Boss Wolf. Acid Slime (green) is in Southwest of Hanun Forest 1, near the leap-gate and near the springs. Starving Boss Wolf (dark gray) is in Hanun / Hanun Forest 2, at the Northwest area. That’s the marker for anything you need to defeat for Bounty Hunter quests, so pay attention to it. Let’s proceed to the lower part of the map. When you reach the area where Lehman is, a scene will start and you get a new quest. Lehman requests to Kiyan to find the wizard that has been appointed to fix the leap-gate who has not arrived yet. Wizard Grumman will be somewhere around Hanun Forest 2. Required: Speak to Wizard Grumman. Capture Wolfdog Grayfang in a steel cage at Hanun Forest 2, and return to the Guard Zone. Required: 1 Wolfdog Grayfang, captured in cage. I found the Acid Slime (for Bounty Hunter) here in Hanun Forest 1 near the leap-gate on Southwest. It’s green. Take the exit on South-East. 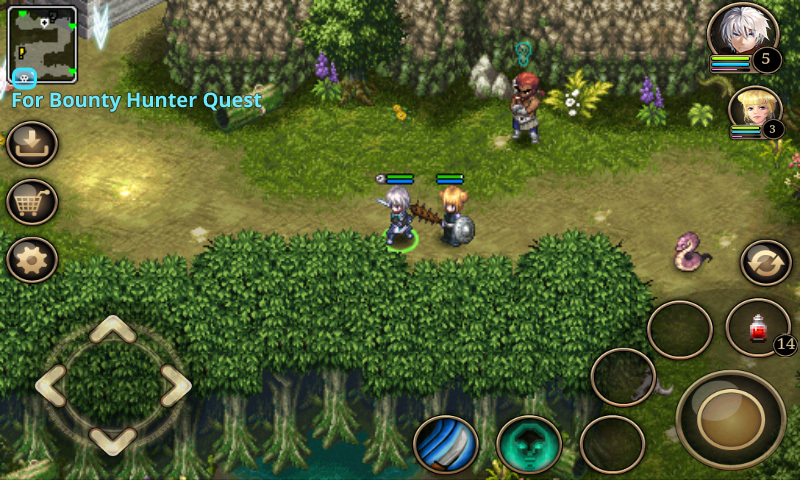 You are now in Hanun Forest 2, even if the game tells you you’re in “Hanun” as you enter. The other guy you need to defeat for Rookie Bounty Hunter quest is in the East of this map. It’s the Starving Boss Wolf, which is reddish in color. Wizard Grumman rejects to return with Kiyan for he fears the wolves. Kill 5 wild wolves in Hanun Forest 2 to ensure Grumman he’s safe. Kill 5 wolves around the Hanun Forest 2. Starving Boss Wolf doesn’t count in. Only gray Wild Wolves do. Talk to the wizard again to conclude this quest. Before we return to Lehman at Hanun Forest 1, let’s catch the Wolfdog Grayfang first. It is a dark ray wolf at the Northwest of the map. There’s no marker for this guy in the mini-map since it’s not for a Bounty Hunter quest. If you stand near the spot where Wizard Grumman was earlier, you’ll see the dark gray wolf to the left. Attack Wolfdog Grayfang until defeated. Then examine it to put in the cage. Let’s now return to Hanun Forest 1. A scene should begin when you enter. Conclude side quests before taking the leap-gate because they will be cancelled. Talk to Guard Zone to conclude his quest. Then talk to Bounty Hunter Lars on the North. I got the Shining Official Bounty Hunter Boots from Lars. When ready, talk to Lehman and take the leap-gate. Watch the scene. Lehman says the Channel is in the deepests of Arnen Castle. Save the Channel and return to the Empire by going through the leap-gate. You will be at Old Sanctuary. Enter the castle on the Northwest entrance. Now you’ll be at the Northwest side of Arnen Castle. You’ve been captured by Arnen soldiers. Lehman told Kiyan they are outnumbered, so he ordered to defeat 8 Arnen sentinels. Kill two Arnen Guard Leaders, who you can find at the Southwest and Northeast rooms of this map. Talk to the Channel Rescue Crew again to conclude that quest. Kill 8 sentinels too. After killing 8 sentinels, watch the scene. Arnen soldiers are growing in numbers. Lehman feels outnumbered to charge forward, so he orders Kiyan to save the Channel on his own. Exit this area by going to the Northwest. Please bookmark the URL of this walkthrough and check again soon. Thank you. For now you can visit some of the following links to other sites related to Inotia 4 walkthrough. You may suggest links to Inotia 4 walkthroughs for me to add to the list. I couldn’t find enough. Playing on my Android Xoom; it’s way better…. I couldn’t find Inotia 4 in Google Play but found an APK called Inotia 4 PLUS. I agree with you, it’s way better than Inotia 3! It is pretty cool on the Xoom, but how do you help yourself from hitting the Action buttons and switching to ather app by accident?? Would you have info or links of differences between 3 and 4? woah, this one is harder than 3, that’s all i can say. boss battles are hard.no one in my team can tank. my main which is a warlock won’t survive 10 seconds haha. None yet 🙁 The version I’m playing allows me to add skill points anytime so my main character is actually overpowered :”) Not sure if bug or normal in the Plus version of the game. All I noticed was that mercenaries are weaker compared to Inotia 3’s. I will, maybe when I finish this walkthrough. I got a long way to go. haha. How do u use the orbs and weapon/armor scrols? just drag them to the weapon/armor that you want to upgrade..
there will be some story characters joins you party..
Hi Catzie. thanks for the walkthrough and tips, I hope you can finish it despite your schedules. By the way, did you encounter a problem/bug/issue on Inotia 4 PLUS v1.0.3 where your saved file is missing when trying to load?. I encountered that kind of issue. tried to quit from the game and relaunch it but my saved file is still nowhere to be found. The odd thing is that when I installed the google play version Inotia 4 v1.0.6, i tried to launch Inotia 4 PLUS v1.0.3 and to my surprise…there it was! my saved file. Perhpas this is a bug of Inotia 4 PLUS v1.0.3 but im not sure. Hello. That happened to me too! I thought I accidentally deleted my saved file, but after doing something , it came back. If I remember correctly, restarting the device fixed it for me. dex, vit with 3:1 ratio. that’s what i use..
Hmm, I choose Dexterity & Strength. If there are 3 points, I will distribute 2 to Dex and 1 for Strength. Is it a good choice ? Great gameplay, but what’s up with the ending. It feels so empty after. I felt the same about the ending. Hello Catzie ^_^ up to what level is the max level. Hi, max level is 105 so that’s why.. You’re challenge make your team stronger by equipments and party management (may require creativity) to get you through the layers… GL! i have a problem at the sealed stone center.. i don’t have healing potions and resurrection scrolls. very hard for me to defeat the four golems. how can i buy from a mercenary? URGENT. too bad can’t do anything. what u can do is try to defeat the golems by swapping ur characters. i too have a hard time with those coz i also don’t have any potions that time. what i did was put 2 rangers in the party and do some hit and run strategy while the other characters attack. and also don’t forget to save each time u defeat a golem. I have a problem facing bosses here, most normal monster are so easy to beat while bosses will hit us pretty hard. I’m playing an Assasin now with DEX:STR build hoping to dodge some enemies attack, but its a tough build. Any helps on party here? have an assasin also. i put some vit to the stats to make it a little tougher. for the party i put a ranger and a divine mercenary (warrior). sometimes i put 2 ranger and just swap characters when someone is loosing HP. a little bit tricky though coz you have to look out who`s the boss is attacking. i think i met the requirements but i cant ge the skill. what should i do.. . . .please help me. . .thanks in advance. . .
hey! great guide!! it really helps! although… can you tell how many recipies the fusion machine gives you? Hi Its nice that you’ve created a blog about this game. I just played recently and I am @ level 15(Assassin) my question is there any leveling tips ? Also about the weapons also the attributes what build can you advice for my character ? its not better than inotia 3,inotia 3 have global map. u can go back any tym u want…..INOTIA 4 MAP SUCKSSS!!! but the game play GOOD! how to use combine scrolls? Was hoping you could help me please? I am currently stuck in the “Eternal Forest” and have been trapped in there for the past month with no wy out!?! Any ideas/ solutions how to get out please???? Can Inotia 4 support Gingerbread 2.3.6 ? My mercenary died and I was wondering if there was a way to bring them back to life? Hi, at the beginning of the game, Darius gives you a merc emblem correct? The one he gave me I got a Priest, she has the heal skill. and other usable skill, but I never see her use any, esp the heal, the merc never heals me!! The merc is using a club and a shield. Does that have something to do with it?? Help please! Hi we’re is the continuation of the walkthrough pls. I’m in goblins lair to save the channel, and I think im lost. Hoping for your full guide on this ios game. Thank you and MABUHAY ka!!. Is this a complete walkthrough?